Ambler, Pennsylvania, is a vibrant commuter town 20 miles from Philadelphia, with an idyllic main street, a close-knit community, and a history intertwined with the legacy of Keasbey and Mattison, a manufacturer of asbestos-containing products. Learn more about the REACH Ambler project and its participants. 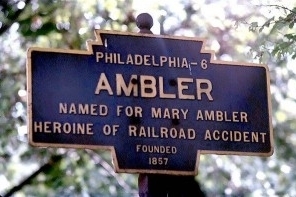 Discover documents and images that tell the story of Ambler, past and present. How teachers, government officials, and communities can use materials created by the REACH Ambler team. Take a journey through Ambler and add your own voice to the story. Learn about Act II Playhouse's The White Mountains, performed on April 25, 2015. Are you an Ambler resident with a story you would like to share? Do you have a question for the REACH Ambler team?